With our CLIMB Works Keana Farms & Polynesian Cultural Center Package, you can enjoy both our zipline tour and admission to the Polynesian Cultural Center! 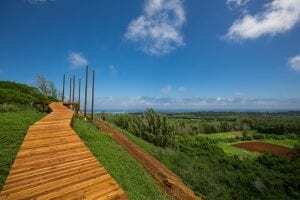 The package includes our 3-hour guided zipline tour that offers gorgeous views of Oahu’s North Shore, and admission to the Polynesian Cultural Center, along with a show and free dinner. At the Polynesian Cultural Center, you can visit 6 island villages and participate in fun activities, enjoy an island buffet dinner, and watch the Ha: Breath of Life evening show. Your day will be full of non-stop adventure with this package! The Ambassador Prime Package includes all the same great things our CLIMB Works Keana Farms & Polynesian Cultural Center Package offers and more! You’ll get special small group guided tours and a shell lei greeting at the Polynesian Cultural Center, as well as a souvenir DVD. For dinner, you can enjoy a Prime Rib Buffet. In addition to getting to watch the Ha: Breath of Life show, you’ll get a special behind-the-scenes tour! Our ultimate Oahu North Shore packages save you $20-$40 per person, and can be booked on the same day or separate days of your vacation! At CLIMB Works Keana Farms, it is our mission to have you step outside of your comfort zone and try a new and exciting adventure! Our zipline tour lets you explore one of the most beautiful places on Earth in a whole new way. You’ll have the opportunity to explore a working agricultural farm on 8 world-class dual ziplines, 2 rappels, 3 sky bridges, an ATV ride, and more. But that’s not all — along the tour, you will learn more about Hawaii culture, taste fresh fruit from the farm, and admire stunning views of North Shore’s famous beaches. The Polynesian Cultural Center brings to life the spirit of Polynesia through its 6 Polynesian villages, a luau, and an evening show. You will get to mingle with natives from the cultures and learn more through their music, dance, and traditions. Whether you choose the Island Buffet or the Prime Rib Buffet, you’re guaranteed to have a delicious meal with flavorful dishes. The Ha: Breath of Life evening show included in the package is an action-packed story that includes fire, song, and dance, with more than 100 Polynesian performers from across the Pacific. Now that you know more about our ultimate Oahu North Shore packages, we bet you can’t wait to start planning your trip! Book one of our North Shore packages today and get ready for an unforgettable adventure.